If you are between the ages of 12-17 (entering grades 7-12) and have studied Piano or a String or Wind Instrument for at least one year, then our INTERMEDIATE B CLASSICAL MUSIC Program is right for you! This Summer, Classical students will be able to select classes in improvisation and play in contemporary music ensembles, as well as in our orchestra! SO... JOIN US FOR AN IN-DEPTH EXPERIENCE WITH OUR STELLAR FACULTY FROM THE UM FROST SCHOOL OF MUSIC THIS SUMMER! The goal of this program is for you to have a better understanding of the different styles of Classical Music. 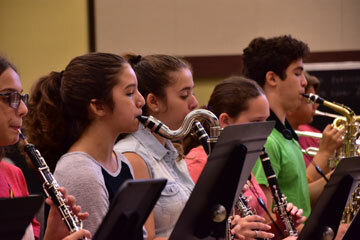 This program includes opportunities for classical players to explore the world of jazz and contemporary music as well as traditional ensembles. And don't forget to save the date - we end camp with a concert where every camper performs with your ensemble! Music Proficiency level 1.5 or above if you are in a school orchestra. Or has completed Book 2 of a standard music series in their instrument. Pianists should be playing Sonatinas or equivalent pieces. All string and wind players must bring their own instrument to Camp. We offer 2 levels: fundamentals and advanced music theory. Our theory classes use the innovative Frost School of Music experiential model, created by Frost School of Music Dean Berg, which incorporates ear training and improvisation. 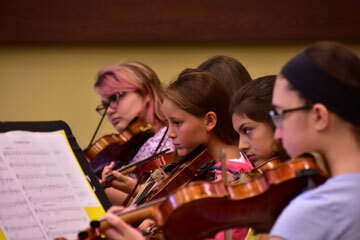 Campers can also select intro to improvisation and jazz theory. History of Classical Orchestra Music - the famous and not so famous composers - including the music of today! History of Classical Piano Music - the greats through the piano music of today. Contemporary String Styles: learn how to play pop, jazz, rock, and more. HOW MUCH DOES THIS COST? The cost is $1275 (A non-refundable housing fee is required at the time of registration to reserve your room. This deposit will be applied to your housing balance.) If you are attending both sessions, a supervised inter-session dorm program is provided for a nominal fee.